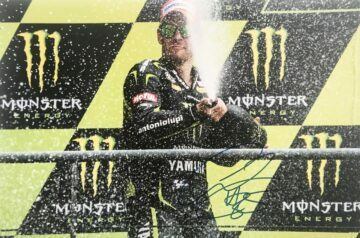 Shop our signed Cal Crutchlow memorabilia featuring autographed photographs and Moto GP related items. Signed shirts, photos & caps all with a Certificate of Authenticity, fast international shipping and free UK delivery, many with signing proof! A true racing legend and revolutionary – Cal Crutchlow has been on the circuit for less than ten years, but in that time he’s certainly made his mark on Moto GP. His destiny as a superbike rider was written in the stars at his birth – as he was named Cal after the American motorcycle rider Cal Rayborn. It was a while though before he lived up to his name – despite his father being an avid racer himself. Aged 11 he began to show interest in the sport and started racing soon after. Aged 14 he won the UK Junior Challenge, going on to win the Aprilia RS125 Challenge just two years later. These triumphs sealed his fate as a professional rider – one that would make waves and change the face of the sport forever. Crutchlow started as a Superbike rider and experienced phenomenal success throughout this stage of his career, winning the 2009 championship and finishing up with 8 wins and 21 podiums. In 2011 he officially announced his move over to Moto GP – a development that caused excitement and anticipation of what was to come for the British racing community. If you love Moto GP, you’ll love our collection of Cal Crutchlow signed Moto GP memorabilia. Here you’ll find a fantastic selection of exclusive items autographed by hand. Each item is supplied with a certificate of authenticity, so you can purchase with full peace of mind.